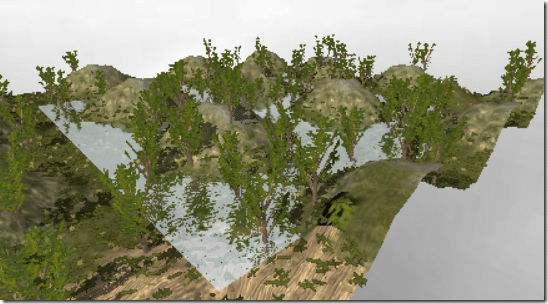 Now let’s populate our game work with some terrain, trees, water and more. We will start by creating a terrain object. 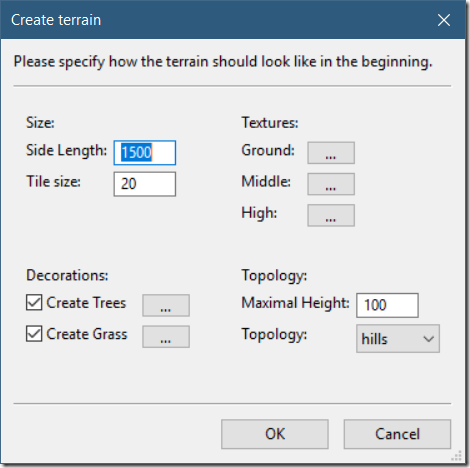 In the Create panel select the Terrain icon. You can accomplish the same thing by right clicking the viewport or selecting the root of the scene in the SceneGraph explorer and select Insert->Create terrain. There are several different things you can control here, decorations will result in grass and trees being populated in your game world. Side Length determines the size of your terrain along each axis, while Tile Size determines the density of the generated terrain. Textures enables you to specify the texture used at ground level, mid level and at high points of the terrain, but we will stick with the defaults for now. Under Topology you can determine what the highest point in your created terrain while Topology describes how the three different options, hills, deserts and flat options. 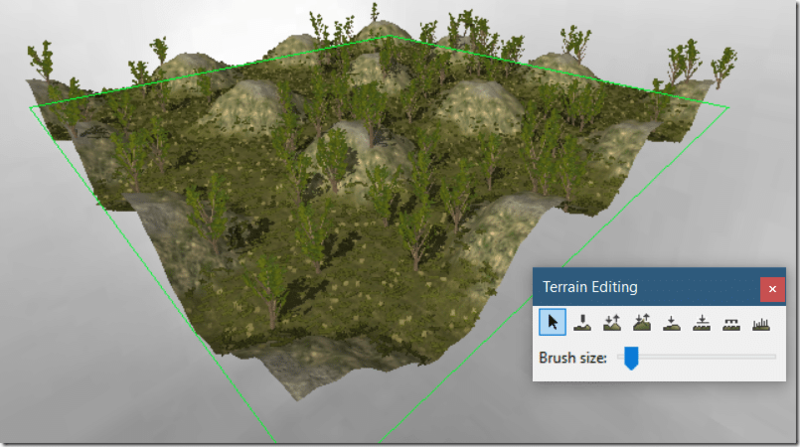 Click OK and your terrain object will be created. You can select each individual tree, deleting or moving them as you see fit. Notice how the trees appear below the Terrain in the list? This is because they are children of the Terrain. This is handy, because if you move the parent, all of the children will move as well. Now you can paint textures in the viewport. 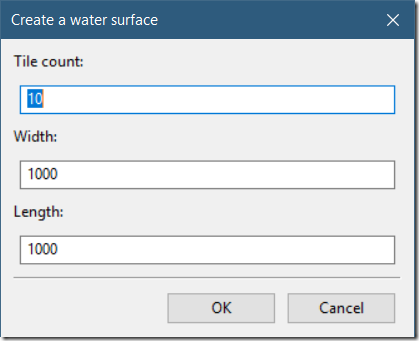 Now left click and it will replace the texture in the selected area. Can be used to raise and lower the terrain below the brush. Click and drag left to lower, drag right to raise. Left click to change elevation, move the mouse up and down instead of left and right. Up to increase height to a hill, down to create a valley. Next is the smooth tool. This simply smooths out edges and can be used to make less sharp edges. This one is pretty straight forward, left click over a surface and it will be smoothed out over time. This tool works like smooth, but instead of rounding down edges, this one just straight out pushes the surface down evenly, attempting to flatten the surface. This can be thought of as a way to randomize the surface. Finally we have the grass tool. You can also hold down the shift key while painting to erase the grass under the brush on the terrain. 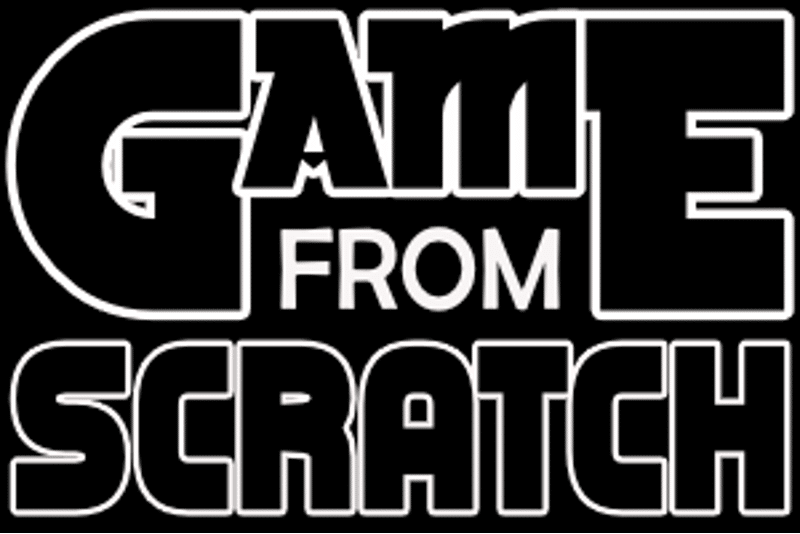 Using this combination of tools you can create just about any kind of terrain for your game. One thing that is noticeably lacking is water. 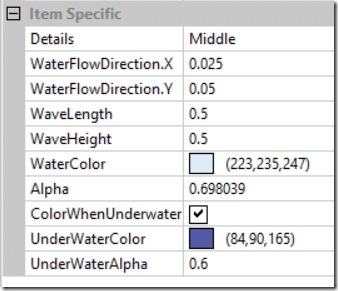 There are a number of different properties you can set for water such as how high waves should be, the color and transparency effect when the camera is below water, the direction water should flow, etc.